WASHINGTON — Two reports last night — from NBC News and the New York Times — appear to contradict some of Supreme Court nominee Brett Kavanaugh’s testimony to the Senate Judiciary Committee from last week. SENATE JUDICIARY COMMITTEE: When did you first hear of Ms. Ramirez’s allegations against you? KAVANAUGH: In the last — in the period since then, the New Yorker story [published on Sept. 23]. But NBC News's Heidi Przbyla and Leigh Ann Caldwell write that Kavanaugh and his team were trying to refute Ramirez’s allegations BEFORE they became public. SENATE JUDICIARY COMMITTEE: Did you interact with Ms. Ramirez at the wedding? KAVANAUGH: I'm sure — I'm sure I saw her because it wasn't a huge wedding. And at any wedding, you would see the people that you went to school with. But I don't have a specific recollection. 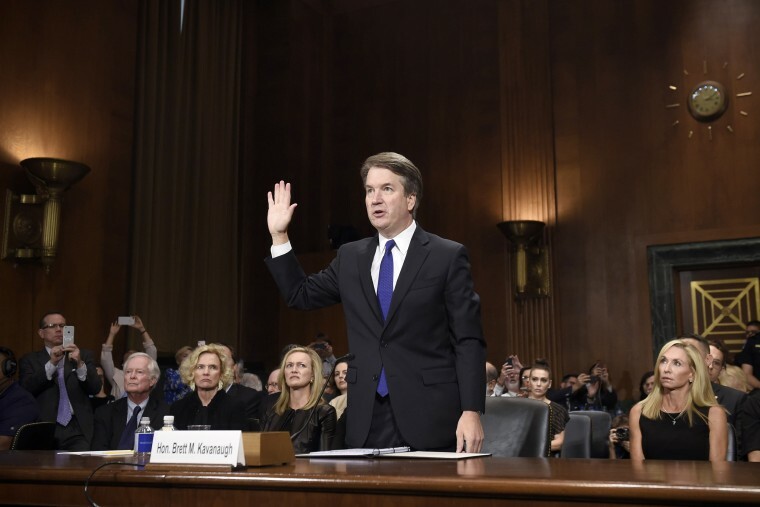 KAVANAUGH: I don’t think that — I don’t — I do not think that’s a fair characterization, and Chris Dudley’s quoted in that [Washington Post] article, and I would refer you to what Chris Dudley said. I spent more time with Chris Dudley in college than just about anyone, and I would refer you to what he said. But the New York Times reports on a 1985 police report (which NBC News has not verified) suggesting that Kavanaugh was involved in a bar fight — with Chris Dudley at his side. And you can now add these examples to other problematic statements Kavanaugh has made — about “Devil’s Triangle,” “Boofed” and that Georgetown Prep boys didn’t mingle with Holton-Arms girls. Does the pitched battle over Kavanaugh help the GOP in red states? While it’s too early to make this conclusion, it’s worth asking whether the fight over Kavanaugh helps out Republicans in red states. We’ve seen the polls — from Quinnipiac and CBS — showing that more Americans/voters oppose Kavanaugh’s confirmation than support it. But that’s nationally. How about in North Dakota? Or Indiana? Or Missouri? Minnesota's state Democratic Party, the Minnesota DFL, issued a statement saying its outside investigation wasn't able to "substantiate" accusations of physical abuse against Rep. Keith Ellison, D-Minn., by an ex-girlfriend. Ellison, who failed in his 2017 bid to become DNC chairman, is currently running for state attorney general in Minnesota. "The investigation report, which was released today without our knowledge by someone outside of our organization, was unable to substantiate the claim of physical abuse made by Ms. Monahan," DFL Chair Ken Martin said of the allegations levied by Karen Monahan. Martin also said the state party was handing its finding over to law enforcement. "For the purpose of objectivity and getting all of the facts regarding these allegations, we have decided to forward the information in the investigation to local authorities in order to let them review the contents and determine whether further investigation is warranted," he said. Ellison's Republican opponent, Doug Wardlow, released a statement calling the investigation a "sham." "As predicted, the sham 'investigation' led by the DFL party attorney's legal partner has concluded in favor of the party's Attorney General candidate. But the publicly available evidence contradicts that conclusion," Wardlow said. A day after campaigning in Tennessee, President Donald Trump travels to Southaven, Mississippi, on Tuesday, where he holds a rally at 7:40 pm ET.